You have supported us at a level we could not have ever imagined, and we can’t thank you enough. As we have grown remarkably busy we know it’s all thanks to you. However, your time is valuable and your families safety is our number one priority. 1. 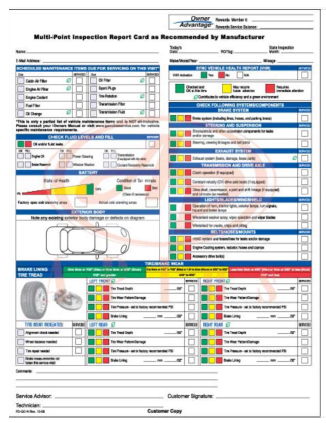 Every oil change includes a no charge report card that will be thoroughly explained and given to you showing our checklist of your vehicle systems including safety aspects. 2. From write up to the report card will take no more than an hour…. You should have received a FORD PLEDGE TIME SLIP with your write up arrival time. If you do not meet with your advisor to review your report card within 1 hour please bring the slip and it will act as your gift certificate for today’s oil change.